Did you know that February 5th is Nutella Day? I actually didn't know there were such event, it seems that it has been running successfully for 5 years. You can read about this event on World Nutella Day. I knew about Nutella Day because of the many tweets and blog posts spammed that day. I love the fact that they share their love for Nutella and the number of amazing desserts using Nutella as an ingredient. I don't recall using Nutella as an ingredient, the last time was used as a frosting for the banana-reese cupcake or as a filling for crêpes. 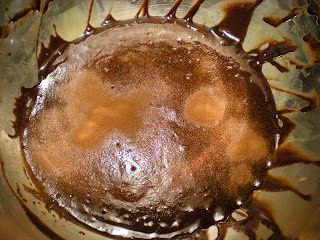 Looking through hundreds of Nutella recipes, one recipe title catches my eyes before reading the recipe in details: Flourless Nutella Chocolate Cake made by the host of Nutella Day, Sara of Ms. Adventures in Italy. At first glance, I was questioning myself, how can this cake be made without flour? In fact, flour gives the structure, texture and shape to the cake, so without any flour, another ingredient must play its role. It is only when I was making this cake that Nutella is actually a good substitute because of its thick texture. I was very surprised of the results when I took the cake out of the oven. One bite is all it takes to blow your mind away. The texture is not like any dessert that I tried before. 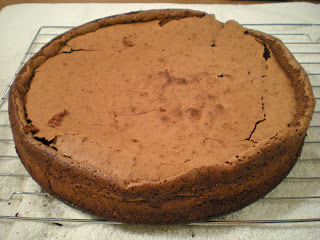 I can say that the texture is between a brownie and a mousse; it is rich, silky, chocolate-y, Nutella-ish and satisfying. 1. Preheat oven to 350F. 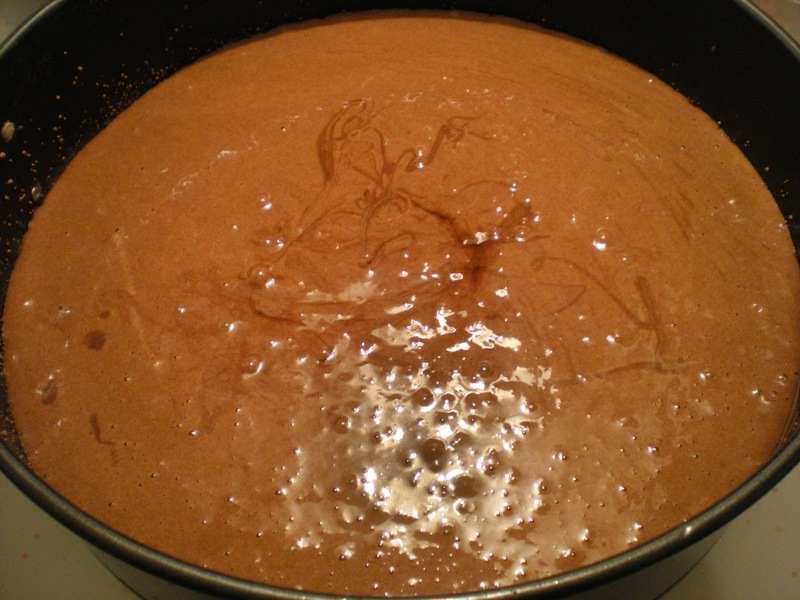 Butter a 9-inch springform pan and lightly coated with cocoa powder. 2. 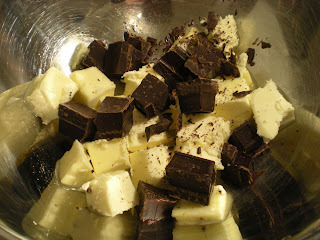 Cut butter and chocolate into chunks. In a double boiler, melt butter and chocolate. 3. 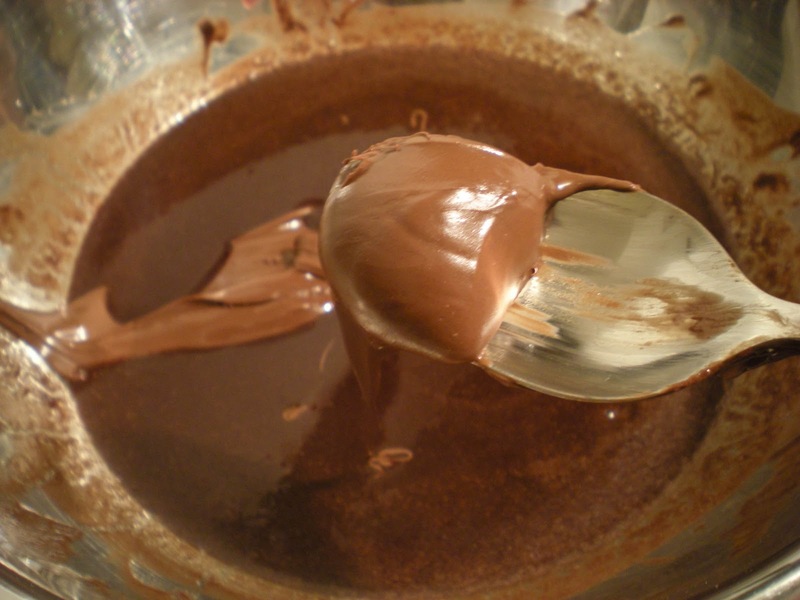 Add Nutella to the melted chocolate and stir until a mousse-like texture is reached. 4. 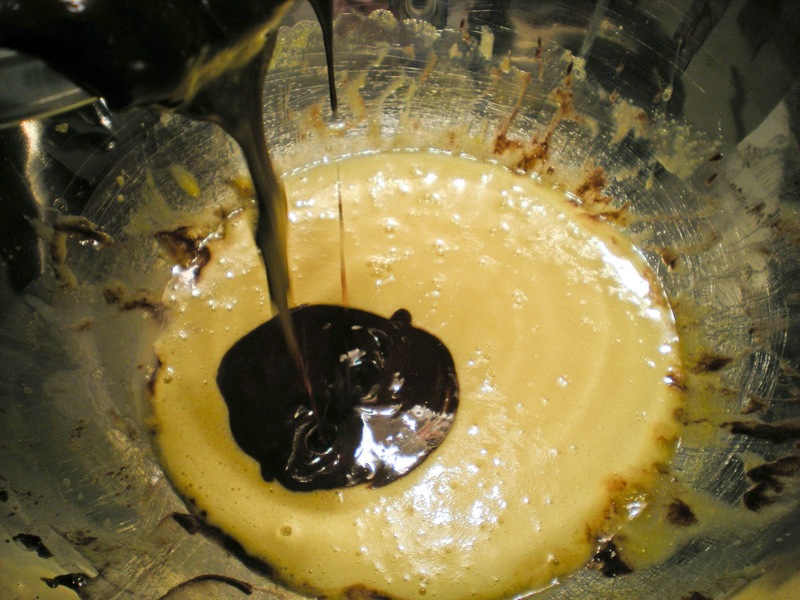 In a large bowl, beat egg yolks and gradually whisk in the sugar until thick and pale. Using a rubber spatula, add chocolate mixture to egg yolks and stir until combined. 5. Mix in the espresso powder. 6. 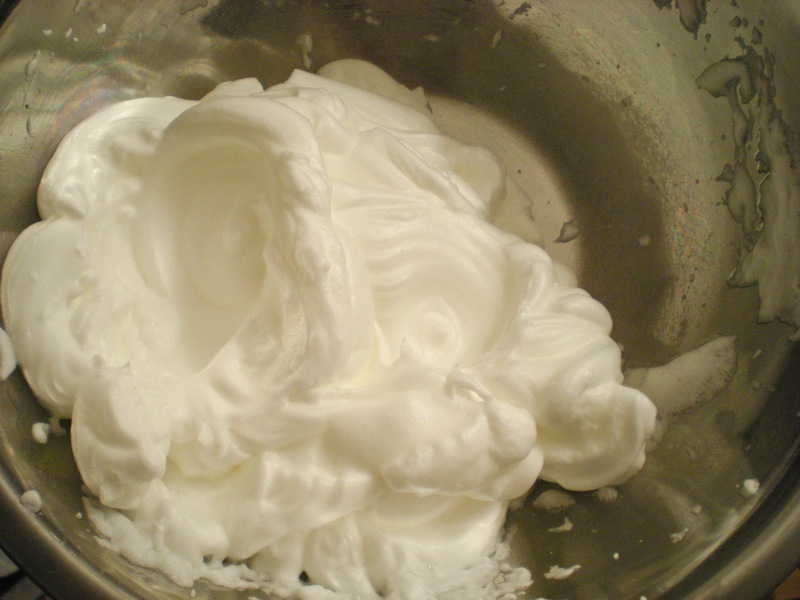 Using an electric mixer, beat egg whites until it starts to foam. Add in cream of tartar and beat until stiff peaks. As a test, the egg whites should not fall if you invert the bowl. 7. 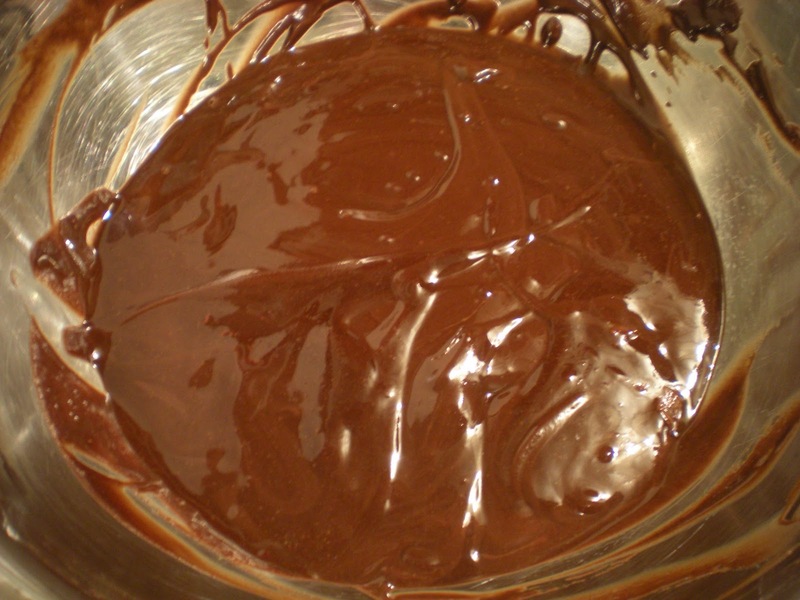 Incorporate 1/4 of the egg whites into the Nutella chocolate mixture. Fold in the remaining egg whites, 1/3 of egg whites at a time until incorporated. 8. Pour mixture to the prepared springform pan. 9. Bake for 25-30 until it passes the toothpick test. Let it cool for 10 mins. Release pan and serve. wooo this looks and sounds great victor! i would love to have a slice! wow Victor, I really really really love to have a slice of this gorgeous looking chocolate cake! WOOooo...I'm salivating over this lovely chocolate cake! Cute cake and clicks.. Love this flourless version and your presentation..! It looks so rich and decadent. You made one gorgeous looking cake. Nutella is so hard to resist! Delicious flourless nutella chocolate cake. I love flourless chocolate cakes! This sounds delicious with the Nutella added. 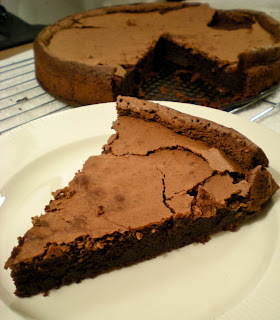 Omg, feel like having a slice, truly irresistible flourless cake..
une texture fondante et intense au chocolat, comment y résister!!! Didn't know that 5 Feb is Nutella day. This cake looks so perfectly delicious! Looks and sounds delicious Victor! I love nutella. I love flourless chocolate cake- it is so rich & mouthwatering. Wow, this looks so yummy! You sure picked the right recipe! hi victor, happy new year to you!! looks absolutely delicious..i might want to try this too one day! I periodically crave a good flourless chocolate cake - all that rich egg-butter chocolate warms me and delights. Using Nutella in this is such a good idea - bookmarked. It just begs to be made. I would've thought the same about the recipe not including flour, but what a decadent deliciousness you've made with the Nutella! I'm going to have to look at using Nutella for something more than just a filling. Devilishly scrumptious! I love flourless cakes. Victor, this nutella cake looks absolutely heavenly! Your pictures are practically melting in my mouth. Thanks for sharing! Hi, Victor. Thank you for stopping by my blog and leaving a comment! I really like your blog's title and subtitle. I have only recently used Nutella as a baking ingredient myself and have only made flourless cookies, so this cake is intriguing to me. I love the flakiness on your crust. Just beautiful! This is positively delectable! Flourless cakes are so rich and delicious - I love them! Wow! this a real treat! may I pick up a slice? Oh man, this is goooood! maybe you will be lucky this time! This looks awesome! I'd love to try it out sometime. Looks absolutely moreish and delicious. This looks amazing! 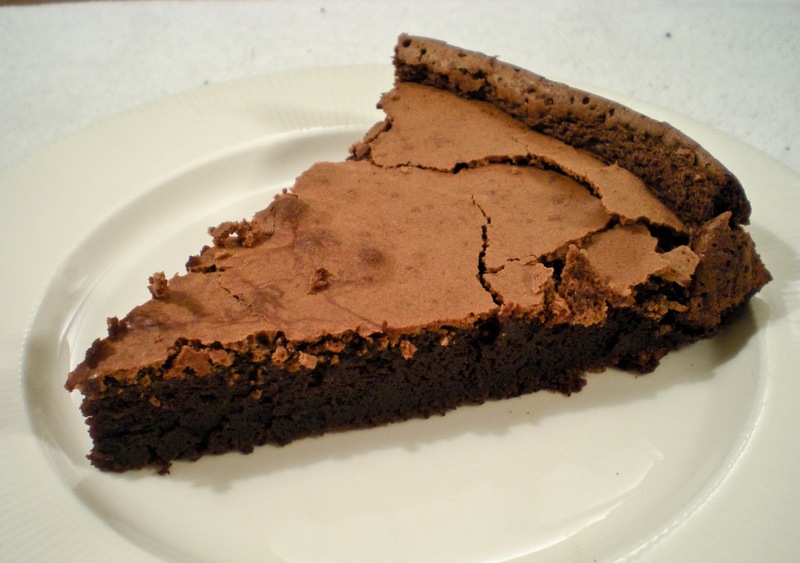 It's like a dense brownie pie-YUM!